Bear Lake Reserve Endorsed Accommodations is the exclusive on-site rental management company for vacation rentals at Bear Lake Reserve in Western North Carolina's beautiful Cashiers Region. Endorsed Accommodations has direct access to the management of all on-site activities, events, and amenities, which enables us to deliver the best possible experience for your vacation rental. Golf enthusiasts searching for a top-of-the-mountain experience won't be disappointed when they play the challenging Bear Lake Golf Club by Nicklaus Design Group®. Offering a par-29, 1,932-yard course at the lofty elevation of 3,400' to 3,700', it has some of the best views in the community. 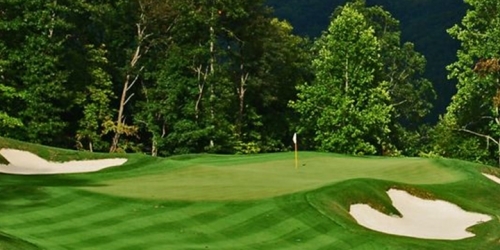 You're going to have to work hard to concentrate while teeing off on the seventh hole, since you'll be looking at a breathtaking 80-mile panoramic view of the Blue Ridge Mountains and the valley below. And, because it's a nine-hole course, you can enjoy a round in the morning and still take the kids for a boat ride before lunch. Bear Lake Reserve reserves the right to change price and offer at anytime. Prices and offer are subject to change without notice. NCGolf.com is not responsible for errors posted in this golf package.